I went on a bit of a Zoya splurge a few weeks ago, admittedly… it was a small one. Those lovely people at customs and excise weren’t gonna get me. Not that I object to paying my duty, I just object to Royal Mail’s hostage handling fee. Grumbles aside, I was pleased to receive my little Zoya beauties and I’m looking forward to showing them. It’s an expensive brand to buy in the UK and not one too readily available from sellers I trust on eBay either. Shipping was quite slow (about 3 weeks), I’ll keep looking for a supplier I like for these I think. 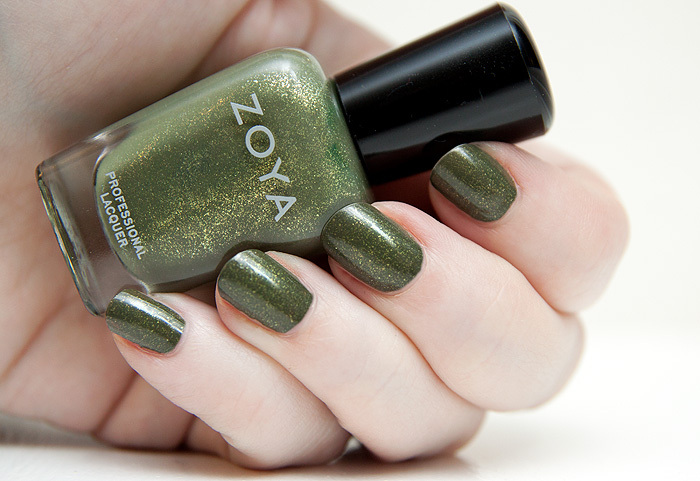 In the meantime, meet Yara from Zoya’s Fall Smoke & Mirrors Collection. Yara is an olive green with distinct leanings toward army greens. The gold sparkles thankfully don’t get hidden too well in the depths of the murk and shine through beautifully! I don’t wear too many greens but I’m delighted to include this one in my collection. Texture was great on this, I was done in two coats. Zoya Yara is available to buy online in the UK from NailCareClub and is priced at £9.98 not inc. postage of £3.50. I paid £6.50 inc. postage from eBay U.S. Yeah. I’ll stick with eBay thanks. EDIT: It’s also here for £7.99 w/free shipping. I went for Option B – paying £500 for a plane ticket to buy it in person from the US! I think I bought exactly 1 Zoya polish in the end. I looked at that one but went for a different one from the collection. That’s such a pretty shade. I can recommend an Ebayer called AllPolisheddUp. I buy my Zoya from her and she’s fantastic (her name has slipped my mind at the moment) but she’s very nice and has reasonable pricing + free postage and she’s in South Yorks. She sells CND, Minx, OPI, China Glaze and Zoya + other things like the Jessica Simpson hair extensions. I use her too, very good service! There are quite a few nail polishes I’d to get from their Fall collection, including this one…Beautiful! Ah, yes, the joys – had a parcel that was 4.32£ VAT and didn’t know about the handling fee. My eyes nearly popped out of my head. Of course the customs threshold is being lowered to 15£ in November, it’s getting hard to find something below that! I want Jem, Tao and Marina! I have a sample of Neeka from my Boudoir Prive box and it came with a colour ‘wheel’ and it has all the Fall colours and I am in love! Hi! I just did a search on ebay and can’t find the new Zoyas below $11.33 shipped, which is almost GBP 7.50. Would you mind telling me which ebay seller you bought from please? Red Lipped Readers – Part Five! Help me design a nail file? Please pick your favourite! Kim Kardashian launches erm, Kim Kardashian! "Have a go hero" or leave it to the professionals?